Misty Winslow is determined to find her prince, and she meets the man of her dreams through an Internet dating service. Or is he, because the new dentist in town also sets her heart aflutter. It's love at first sight for Tyler Davenport, but before he can finish his first root canal, Misty is involved in an exclusive online romance with Wes99—Tyler’s online persona. How can he tell her he’s the man she’s been waiting to meet, and how rational is it for him to be jealous of Wes99! Soon Tyler's pulling out all the stops to woo Misty. As Christmas approaches, Wes99 and Tyler both ask her to meet them under the mistletoe. Which man will she choose? “Why are you so upset? It’s a great chance to meet men with the same interests as you.” Brittney Peters leaned against the doorjamb cradling a large mug of coffee in her hands. “Way to go, girlfriend.” Brittney sent her a beaming smile. Misty wished she could be more like Brittney. No thirty-year-old mother of two had a right to look that good. But then again Britt had always been beautiful. She remembered the first time they’d met at preschool when they were four. Brittney had looked like a blonde, blue-eyed angel in her pink seersucker sundress while Misty felt like a street urchin dressed in an old short set with her red hair scraped back in a ponytail. The teacher brought ice cream as a treat and Misty had dumped hers all over her brown shirt. Every kid in the class laughed at her, except for Britt. She patted her back after the teacher wiped the ice cream from Misty’s shirt, and they shared what was left of Brittney’s cone. They’d been best friends ever since, Mutt and Jeff. “I was thinking more like beautiful, vibrant, and confident.” Brittney looked like she’d stepped out of the pages of a magazine in her turquoise sweater and designer jeans. She even managed to look graceful in four-inch turquoise heels. Misty bit back a twinge of envy and reminded herself the good Lord had made her the way He wanted her—a tall, skinny redhead. Even if she didn’t understand. Misty got up from the chair and walked across the room. “You always know how to make me feel better.” She looped an arm around Brittney’s shoulders. “That’s my cue to get back to work.” Misty pulled an old leather-bound volume of Crosby's Comprehensive Guide to Oral Care from the shelf and started flipping through it. Ooh, a first edition and signed by the author. It might fetch a good price online. Misty bit her tongue. Brittney was moving faster than an Oklahoma tornado and nothing or no one could convince her to slow down. Ten years ago, she took one look at Jon Peters across a crowded room and claimed he was her future husband. At the time it had seemed romantic. Now, well now Misty didn’t want to see history repeat itself. “You know you and the kids are welcome to spend part of Christmas with me. We can have a good old-fashioned Christmas. I’ll cook a big dinner, we can open a few gifts, listen to Christmas carols or maybe watch Christmas DVDs.” She longed for the day when God would bless her with a family of her own to share all the joy and wonder of Christmas with. They chatted about what the kids wanted for Christmas as they walked to the front of the dental clinic Britt’s new boss had purchased from Doc Harris. “It’s called beadboard, and it will look fantastic,” Misty said. Considering Brittney was halfway to the door, Misty guessed it would be a smart idea to say yes. Besides, she’d get a lot more work done when her friend was gone. “No problem, catch you later.” She watched Brittney leave then wandered back to the small dental library. She noticed the faded paint and nicked woodwork in the clinic, not to mention the sixties-style light fixtures. Old Doc Harris hadn’t updated a single thing since he opened the doors for business fifty years ago. The clinic needed a major facelift, and it sounded like the good doctor intended to give it one. Misty slipped a green scrunchie from her pocket, pulled back her hair in a ponytail, popped in her earbuds, and cranked up the volume on her MP3 player. Christmas music filled her ears, and she let out a contented sigh. She sent up a silent prayer that this Christmas would indeed be the most magical time of the year for her. She filled three cardboard boxes with dental journals from 1975. Seemed Doc Harris never threw anything away. She grabbed one of the boxes and started towards the front door. She loved Christmas and since no one was around to hear her, Misty allowed herself the freedom to sing along with the music—loud and off key. As she reached the end of the hall, she tripped, sending the box of journals flying through the air as she grabbed for the doorframe. Her fingers scraped it and one perfectly manicured fingernail snapped as Misty tumbled forward and landed in a heap on the floor. Her elbow slammed into the hard tile floor, and she knew once the throbbing stopped she’d have a bruise the size of Rhode Island. Her chin was cushioned on a pair of brown loafers, the leg of perfectly creased jeans the first thing she saw. “Are you all right?” a deep male voice asked. “Let me help you.” He reached down, grasped her hand, and pulled her to her feet. A boyish smile flashed across his face revealing teeth as white as the fresh snow that had fallen before dawn. Oh man, oh man, talk about gorgeous. This guy rewrote the definition. Forget Rural Romance. The only date she wanted stood about six-foot-two right in front of her. The gears in her mind whirled. This had to be the new dentist, Dr. Tyler Davenport. In a town the size of Winslow, the coffee shop would have been abuzz with news if another good-looking man had moved to town. Wait until she told Brittney she no longer needed to join Rural Romance. Well, at least not until she learned more about the new dentist. Now what had Britt said about him this morning? Brittney. Uh oh, her best friend forever had already staked her claim, and Misty wasn’t losing twenty-five years of church camps, sleepovers, and late night phone calls over any man. Finding her voice, Misty forced herself to answer. “Sorry, your teeth were so white they dazzled me. You must be Dr. Dreamy.” She brushed the dust from her jeans. He chuckled, and heat flooded her cheeks. Had she really said that? “I, uh, I mean Dr. Davenport.” She’d never be able to look him in the face again. Tyler helped her, and in no time the journals were back in the box. Misty felt like a bone caught between two Rottweilers. She knew Brittney wanted her to turn down Dr. Davenport. But how could she without seeming like a total jerk? Misty hated giving up a chance to have a private luncheon with the new dentist. Eligible bachelors, much less good-looking, successful ones, were few and far between in Winslow. But the look on Britt’s face told her she’d made the right decision. Besides, he’d probably only offered out of politeness. A man like Tyler would never be interested in a bookish librarian who hadn’t been on a date in eight years. Beautiful, outgoing women like Brittney were more his type. They settled around an old oak desk in the middle of what had been Doc Harris’s office. Tyler bowed his head and said a silent prayer before starting in on the thick sandwich. His open display of faith impressed Misty, and she quickly did the same. She cut her sandwich in half and poured a generous cup of milk. “Mmm, this is amazing,” Tyler said between bites. Surprise lit his eyes, and Misty felt glad for her friend. Seemed good food really was the way to a man’s heart. As he devoured the last bite of his sandwich, Misty noticed he eyed the remaining half of hers. She pushed it towards him, and he accepted with one of his dazzling smiles. Misty’s heart danced like the Sugar Plum Fairy in The Nutcracker. If she spent much more time around the good doctor, she’d need a pacemaker to steady her heartbeat. The faint ringing of a phone interrupted their conversation. “Whoops, that’s my cell phone. I must have left it on the counter when I came in. I’ll be right back.” Brittney hopped up and went to answer the phone. The second she left, Tyler poured half his milk into Misty’s glass with a wink. She nearly laughed out loud. Instead she forced herself to take a huge swig before Brittney hurried back into the room. Misty pushed away from the desk. “I need to get to work. There’s a room full of books calling my name.” She could still hear Tyler and Brittney’s conversation as she walked down to the small library. Lord, I need You to help me out here. I don’t want to make a fool of myself, and I refuse to betray my friend, she prayed as she started filling boxes. A few minutes later the clean, spicy scent of Tyler’s aftershave wafted over to her, and she looked up to find him standing beside Brittney in the doorway. “It’d make a great storage area,” Brittney said. Misty grabbed another dusty book to keep from reaching over and covering his hand with hers. What was wrong with her today? “That’s an excellent idea.” Tyler flashed her one of his megawatt smiles. “Since you’ve done this before, would you be willing to lend a hand?” Tyler asked. She couldn’t refuse. After all, Winslow was a small town and folks helped out each other. “Sure, I’d be glad to.” One look at the storm raging in Brittney’s eyes, and the smile slid off Misty’s face. Maybe she’d been a little too eager to assist. Question 1: Tyler thought he had a good reason for hiding his true identity from Misty. Is there ever a good reason for deception? Answer 1: No, Tyler regretted his decision to hide his true identity from Misty. Deception always causes problems. Question 2: Misty prayed to meet the man God planned for her to marry. She nearly let loyalty to Brittney blind her to God's answer to her prayer. Have you ever let something or someone keep you from hearing God's answer to your prayers? Answer 2: Depends on the reader. Question 3: Misty's friend Brittney was going through a hard time spiritually. Misty was always there for her friend. Have friends helped you in your spiritual struggles? Answer 3: Depends on the reader. I pray they've all had someone willing to be there for them. Question 4: Memories of summers spent with his Grandfather contributed to Tyler's purchase of the dental practice in Winslow. Have you ever let memories guide you in making important decisions? Answer 4: Depends on the reader. Question 5: Misty loves everything about Christmas, but she never lets the hustle and bustle keep her from remembering the true meaning of the holiday. In today's hectic world, do you find yourself getting caught up in the season and forgetting about the true meaning of Christmas? Answer 5: Depends on the reader. Hopefully, they will all say no. Question 6: Both Misty and Tyler are faithful to their friends. Are you a faithful friend? Answer 6: Hopefully they will say yes. Question 7: When Brittney miscarried, she felt God was punishing her for not wanting her baby. She focused on her own condemnation rather than God's mercy. Have you ever let guilt keep you from accepting God's grace? Answer 7: I think at one time or another most of us have. Question 8: Tyler loved his Westie, Chester. Do you have a pet who holds a special place in your heart? Answer 8: I do. I have three adorable dogs and two are Westies! Question 9: Misty loves her job as town librarian. Do you find your job fulfilling? Answer 9 Depends on the reader. 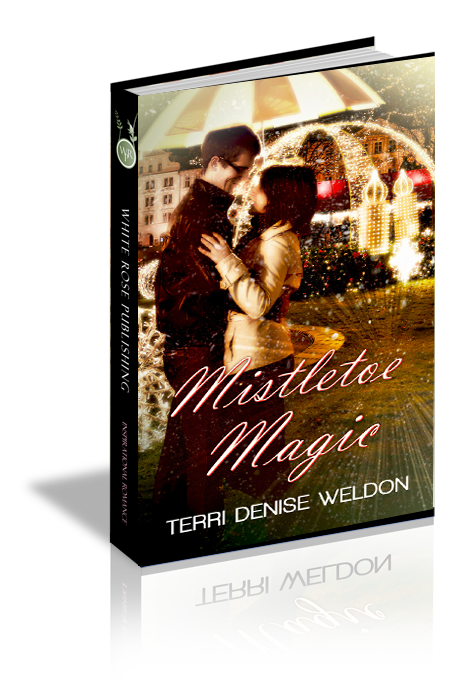 Question 10: Did you enjoy reading Mistletoe Magic? Did you have a favorite part of the book? Answer 10: I hope they say yes!